Looking for $400 performance in an under-$100 eyepiece? Then you can look no further. With features like a wide 70 degree apparent FOV, five elements of fully multi-coated high-index glass, beautiful black anodized body and barrel, the Agena Super Wide Angle (SWA) eyepieces are as close as you can pget. These eyepieces will give you crisp and wide views of the Moon, planets, galaxies, nebulae, and star clusters, rivaling the performance of much higher priced eyepieces. All these three eyepieces offer a great value, with a lot of "bang for the buck." 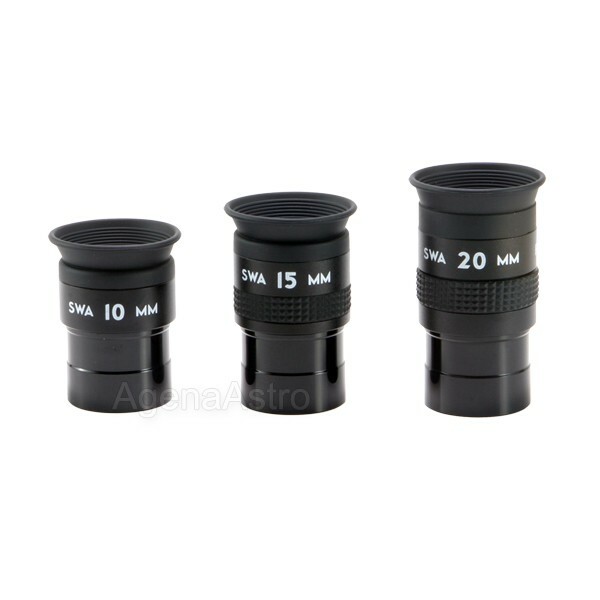 Agena AstroProducts has really raised the bar with this line, and in the under $100 category, I feel that it would be difficult to find another line of 2-inch eyepieces that offer better performance for the price. "Excellent performance in an inexpensive package. Highly recommended whether you wear glasses or not. These are great all purpose eyepieces...an incredible buy!!" 4.9 (Based on 7 Reviews) 100% of reviewers recommended this product. The weather here has been sketchy, but I have been able to observe the moon and a few clusters and nebulae. These are very good eyepieces, noticeably wider FOV than Meade 4000 plossls, and the contrast is better.They aren't sharp all the way to the edge, but very nice in the center. The wide FOV allows you to let objects drift for a longer period of time (important with a Dob). I was even able to get a couple of nice moon photos with the 20mm through an Orion XT8 using a cell phone. The real test will come on planets, but from what I can tell so far from observing lunar craters, views should be very good. Review by SlideRule of Madison WI. The Agena SWA line is a superb bargain. These eyepieces work well in F6 telescopes, and very well in F6.5 and above. Very good engineering and manufacture. I have and use TV and UO with similar AFOV. But for Star Parties, Astronomy Merit Badge, Grab and Go, other "many hands, eager hands" uses these just can't be beat. Peace of mind combines with the Agena SWA very good optics to create comparable views in the central 2/3s of the field, with the surround enhancing the experience. A set of three in 10x, 15x, 20x costs less than one of "the best". The 2 inch series also recommended (but obviously much heavier). Include Agena's case, excellent customer service, prompt free shipping and you are at 5 stars. Review by woody of Atlanta. Review by Matty of Melbourne Australia. I bought two sets of these for my WO bino's. I searched around for a long time and kept coming back to these, and am glad I did. Could have spent a small fortune on other eyepieces but these do all I want. Well made, lightweight and small. Views are excellent almost to the edge in my f8 refractor. The 10mm is a bit tight on eye relief as a bino pair but OK in mono mode. Review by Ray of Miami FL. I was suprised when I first used these eyepieces. They gave a clear and bright image in my 4 inch refractor. It is a great upgrade to the standard eyepieces that usually come with most telescope packages. Review by condonate of Green Bay, WI. My experience with the Agena SWA eyepieces has been very positive. Stars remain sharp nearly to the edge on my 12" f/5 dob when many other lower/mid priced eyepieces I have tried over the years fail to deliver. Review by goupilastro of France. Use with celestron C6 and Skywatcher flex tube 12"